Hassler returns to his old stamping grounds of rural Minnesota in two novellas. 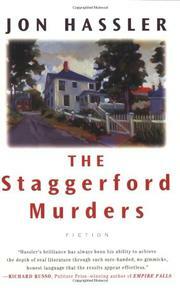 The first is set in Staggerford, more than familiar to Hassler fans, and concerns two long unsolved cases: a murder and a disappearance. It also features five different narrators, of whom the most significant is Grover, 81-year-old desk clerk at the town’s fleabag hotel. Much of the action unfolds in the hotel lobby, so Grover makes a good witness. Nine years before, Neddy Nicholls, a Chamber of Commerce functionary, had been shot dead in front of the movie theater; soon after, his wife Blanche had mysteriously disappeared. Now Blanche’s daughter Penny Jean is on her way home from California to unravel the mystery, and Blanche’s ex-husband George is looking for Penny Jean. The two come together in the lobby, where long-time resident Dusty, a simple-minded retired garbageman, has just claimed he killed Blanche. The facts of the two murders are established quite fast, in a vaudeville atmosphere that climaxes in the hospital where Dusty, stricken by a heart attack, is first baptized with motor oil by his preacher nephew Ollie, then smothered by George (the heavy). The romp is a bit too frantic, and the folksiness is overdone. The second novella is much more dour, unusual for the upbeat Hassler. It’s the story of W.D. Nestor, the title’s nephew, at age 72 looking back at his life. Raised on a prairie farm and frequently whipped by his mean-spirited father, W.D. became an angry man, never laughing or crying, and loving only his wife Lucille (though the love remained unspoken). The couple’s snowbound wedding night is the one bright spot in W.D.’s memories. Late in life, the turkey farmer becomes friendly with a small boy; there’s pathos here, but then, jarringly, the story skips ahead ten years, to W.D.’s fatal visit to his ancient aunt Nancy. Minor work from Hassler (The Staggerford Flood, 2002, etc. ).